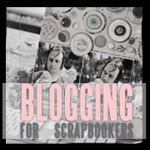 Wizbits Blog: UKS blog hop. Liz- thanks for visiting my blog and commenting ... I love your project! Isn't it satisfying when you know you have created something lovely yourself, and also saved some cash into the bargain? Happy scrapping!